When the name “green” comes to our mind, we tend to visualize forests and other greenery. The colour green in itself is a very beautiful colour. In fact, sometimes it is considered to be the colour which can make you look more vibrant, especially during winter. You can wear this colour on your dresses like jackets, blazers or trousers. 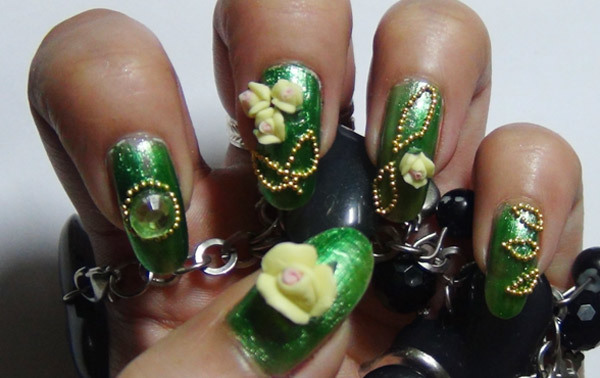 When opting for a green dress, you may want to try out green nail art. 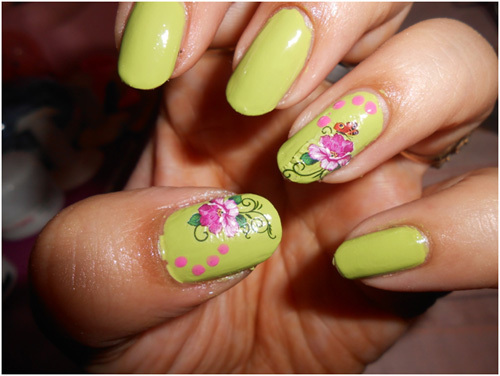 Today, I will show you two easy-to-do green nail art designs which you can try out. 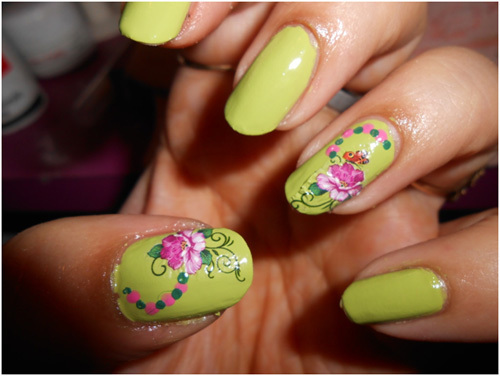 The first one is a purely free hand nail art design. Let’s see how you can do it. Use a base coat to protect your nails from acrylic colours or chipping. 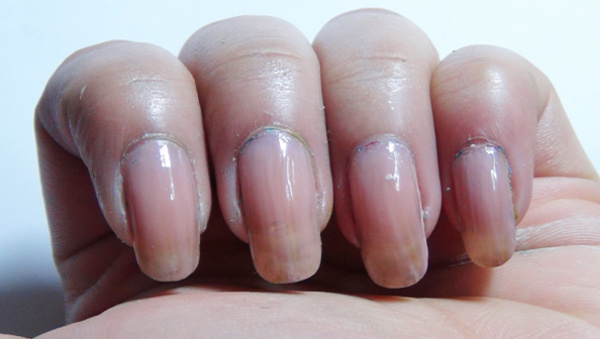 Now use a layer of skin coloured nail polish. This will make the base more opaque. When the skin coloured nail polish dries, use 2 coats of yellow nail polish. 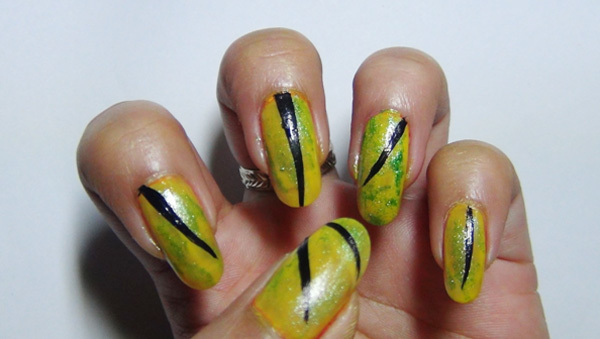 When the yellow colour dries, take a small bit of sponge and dab on some metallic green nail polish on to the nails. It should look something like below. Now use your nail art brush and black acrylic colour. Use this colour to make the central veins of the leaves. It should look something like below. Now clean the nail art brush. 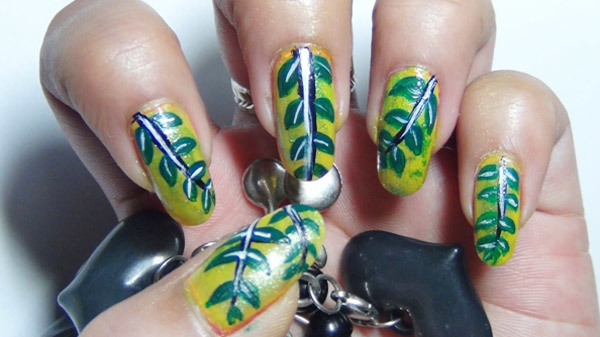 Take green acrylic colour and paint some leaves as shown below. 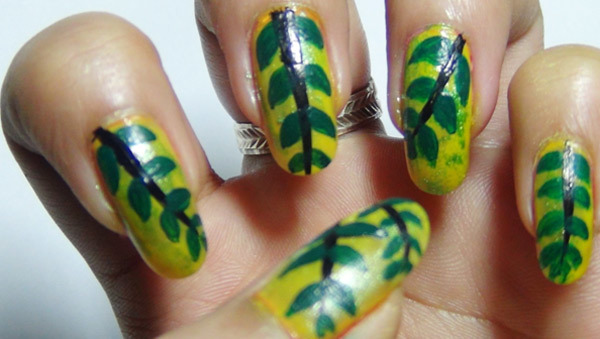 After you have done the leaves, use a white striper or a very thin nail art brush and make white veins for the leaves. Wait for the design to dry completely. 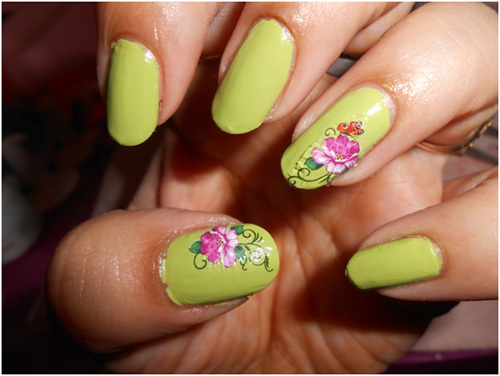 Use a transparent top coat to cover up the whole design. It should look something like the picture below, when done. Gold goes very well with dark green. 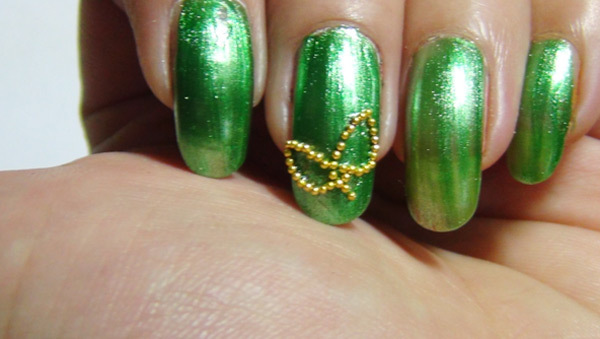 Keeping this in mind, I came up with this glittery nail art which you can wear with your green party outfits. You can also try this for traditional occasions. You can wear this with a golden or green saree with golden zaree work. You can also try this with your suits or salwars. Apply a nice layer of skin coloured polish. Next apply 2 coats of green metallic nail polish. Let it dry completely. 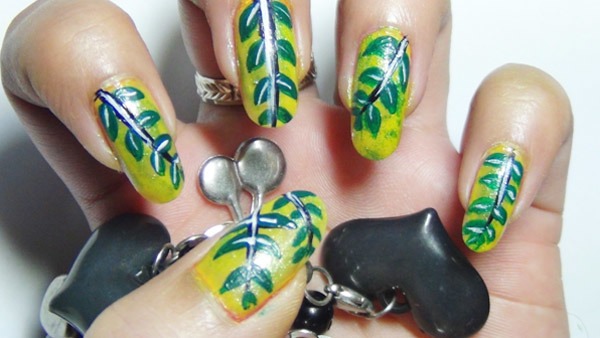 Now apply transparent polish little by little in the shape of leaves. Take golden caviar beads with the help of an orange stick. Now place these as per the shapes you have in mind for the leaves. 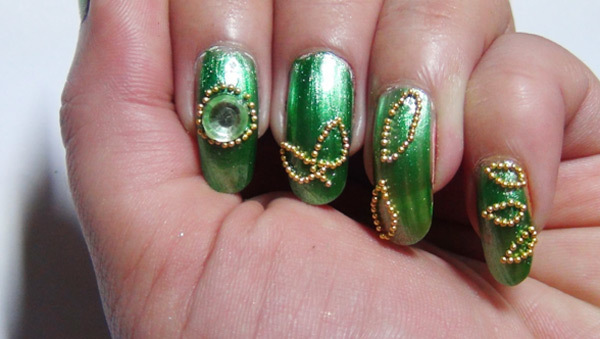 In this way, complete a few leaves and also place a big rhinestone on to the first finger with the help of the transparent polish or nail art glue. 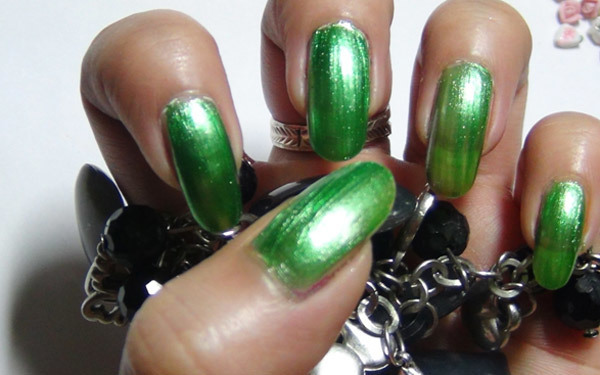 Light green shade (Sally hansen xtreme wear envy with green). Prep up your nails by removing any old nail polish and filing your nails. Apply base coat and let it dry completely. Now apply your light green polish on all your nails. Add water decals to your ring finger and thumb. 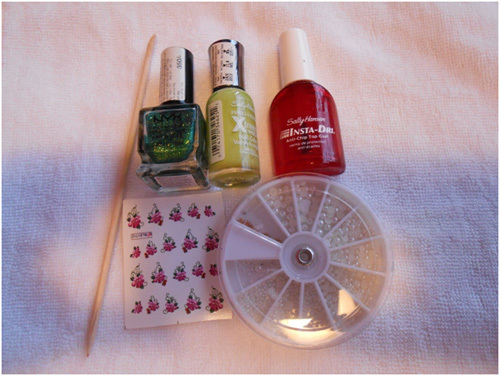 (Method: cut the decal as desired and dip it into the water using tweezers for 3-4 minutes, take out your decal and it will slide automatically and then apply it your nails) You can also use stickers instead of water decals or temporary tattoos cut to fit your nails. Add few pink dots just above your decal as shown in the picture. Now add few dark green dots too as shown in the picture. Apply glitter nail polish on your middle finger. For better coverage, I suggest adding at least 2 coats of polish. 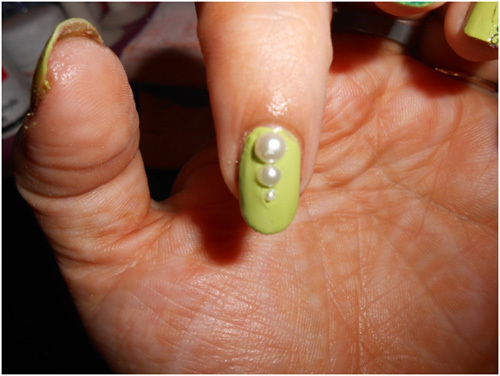 Add pearls in three different sizes to your nails. 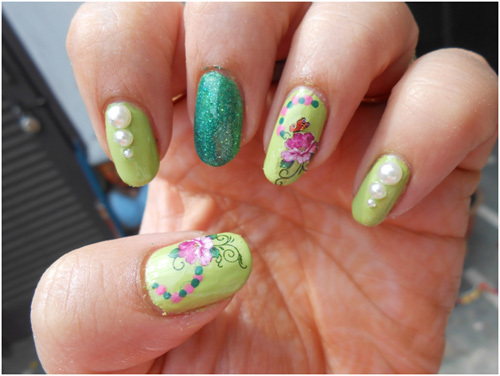 You can add them using topcoat but don’t apply the top coat over them as it will take away the shine of the pearls. If you don’t have pearls, you can use bindis in three different sizes (they are easily available in the market) or you can also add three white dots in different sizes (if you don’t like adding 3d stuff to your nails). Add a generous amount of topcoat to seal and protect your new nail design. Give it at least 30 minutes to dry completely before starting any heavy work involving hands. 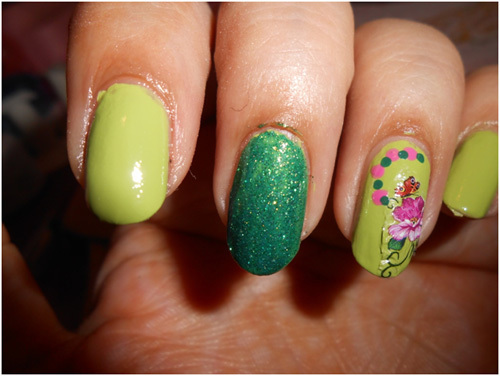 Here is the final green nail art design.